It has been an exciting month for new products from VioVet and there is something that will suit every loyal pet owner. The first item we feature this month is the Loc8tor Pet GPS Outdoor Tracker which is a great idea for those animals that tend to wander, or anything else you want to be able to track. For the horse owners amongst us we have a new range of high quality leather care products from the newly established Saddle Clinic. For dogs we have a new range of grooming products from Butch & Bess, cat owners can now improve the dental hygiene of their cats with the new additions to the Arm & Hammer range, and to finish off we have a new habitat for small pet owners from Superpet. The company Loc8tor was started to combat real life experiences of valuables, pets and even people going missing. They have produced a range of tracking devices which help you to find your lost keys, a hiding child or a roaming pet. For whatever scenario you may need help with, Loc8tor have something that will help. We have had Loc8tor Pet and Loc8tor Plus on the site for a while now and have noticed great feedback from their products. That is why we were so excited to get hold of the new Loc8tor Pet GPS Outdoor Tracker. It has a plethora of features to give you piece of mind with anything that you want to find at any time. If your dog goes missing you can quickly see where they are without a huge panic, and let the GPS lead you right to them. You can use the detailed tracking panel on your computer, tablet or mobile phone, so there will never be a time where you shouldn’t be able to find what you are looking for, whether it be an animal, child or even your car. Saddle Clinic is a new creation from Furniture Clinic who have a wealth of experience behind them in leather care. Not only have they been making products to treat leather but they have a number of technicians carrying out repairs and restoration on leather all over the UK. What better people to trust when caring for your leather? Whatever your saddler needs, whether it need cleaning, conditioning, reviving, re-colouring or having the mould removed from a saddle which hasn’t seen use in a while, you will find it in the Saddle Clinic range. For a perfect starting point we have the Leather Care Kit which contains a bottle of their Saddle Soap Cleaner and one of their Saddle Soap Conditioner. A great way to treat your used saddlery to some much needed treatment. We also have the rest of the Saddle Clinic range on the site some of which can be found by clicking on the following pictures. Once in a while it’s great to give your dog a good clean, not just to stop them from smelling bad but to look and feel great. 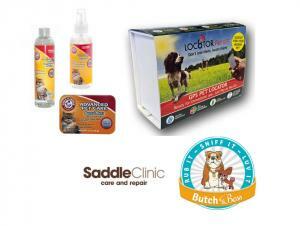 It is great to see Butch & Bess as our new range of grooming products for dogs this month. Butch & Bess was created from the frustration at not being able to find quality dog grooming products which do not contain added chemicals. You will find that all their products follow this rule while being kind to both you and your dog’s skin. They also have delightful fragrances so your dog can smell as clean as he is when you have finished. As well as various shampoos to get your dog feeling, looking and smelling great, their range contains grooming sprays, a detangling spray, pet bed and car deodorisers and even a perfume for your dog. So why not have a look through the Butch & Bess range and see if something doesn’t attract you. Dental problems can be costly for not just us but our pets too, so it’s a great idea to look after their hygiene before it’s too late. Not only can their breath start to smell but the can develop problems with their teeth and gums if not looked after correctly. That is why it is great to see that the Arm & Hammer range which is suitable for dogs, has been expanded to include products for cats, which we have added to the site this month. There are three products which can support your cat’s dental health, including Dental Water Additive which is just put into their drinking water, Dental Spray which can be sprayed directly into their mouth, and Dental Mints which provide a tasty way to treat your cat as you look after their mouth. All products help to clean your cat’s teeth and gums, while also helping to freshen their breath. The new month brings with it a new habitat for your small pets from Superpet. There is currently a range of homes and accessories available, which has been made even more exciting from the addition of the Crittertrail 360 Habitat. This home provides your small pet with a corner-less cage which is easy to take apart and clean. There are no walls or sections which block light from coming in to your little pet’s home so they can always be in view. Not only do you get a great value cage, it also comes bundled with a water bottle, food dish and exercise wheel. It’s all that your little friend needs to keep them happy.